Guitars you wish Squier would make. Discussion in 'Other Squiers' started by stratman420, Mar 21, 2019. I would like to see them produce their hollow bodies again. You can still find them used but HOLY MOLY they bring some dollars. Davis Sharp, stratman420 and RoyalWe like this. stratman420, SquierTap and squierbilly like this. Classic Vibe Esquire would be an instant classic. EDIT: I think a Squier version would sell tremendously due to its simplicity in a "beginner" brand. It would be a marketing dream. I have not been in a music store in eons, so do not have new guitar contacts. 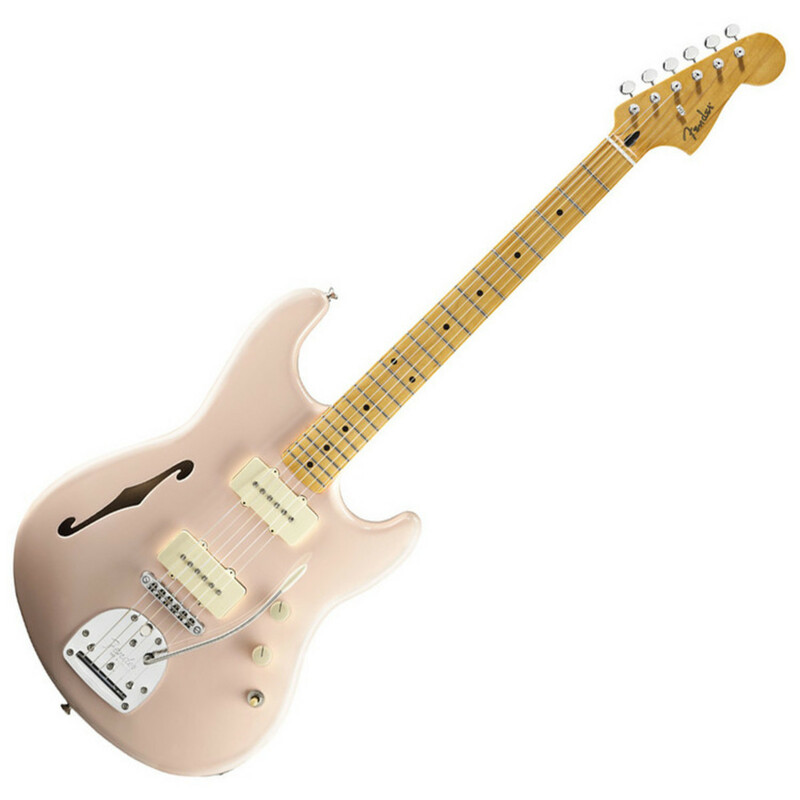 Does anyone know how Fender's crazy reality series (can't think what it is called lol) sold? IMO they looked like any partscaster imaginable with the right type of sauteed shrooms. MIM with oddball pick guard / pickups / switch plate combinations. Las Palmas Norte, Taurus, wildelectric and 3 others like this. Aren't they makin an Esquier now? drewcp, Taurus, mimmo and 1 other person like this. Reissue of the original Squier 1 bullets, the S2 and H2 models! I also wish they’d continue the 51 and expand the line, I like the idea of the mini jazz bass body with 3 Jaguar pickups for a Squier “62” (or something like that). Also, I don’t why this isn’t a thing already, a thin line jazzmaster! Maybe then it’d Actually get used for jazz lol. drewcp, Taurus, daan and 3 others like this. I'm on board with this but I'd be surprised if it ever happened. Converting a two pickup Tele to an Esquire is easy enough. Also, maintaining the rarity and mystique of the Esquire would prevent Fender from releasing too many options for getting a factory made one, IMHO. stratman420 and Loin Lover like this. SquierTap, Stratlover84 and stratman420 like this. He says it's 30 years old, and doesn't mention where it was manufactured. Anyone know if this was a stock product? SquierTap, drewcp, backporchmusic and 2 others like this. A Squier version of the new Fender Sixty Six model would be fantastic…. I second the suggestion above about a hard tail Strat, HSS configuration…. 22 frets and a 12" radius…. A tele with a mini humbucker in the bridge and a single in the neck… with 22 frets and a 12" radius…. Taurus and stratman420 like this. Oh yeah!!! A Squier Sixty-Six would be great!!!!! Squier needs to make two neck sizes for the Affinity and Bullet brands, the current 'skinny carve' and a new 'chunky carve' and identify which is which clearly. Very clearly-- like 'grubby used guitar picture on ebay' clearly. There is a large segment of buyers, like myself, who have stopped buying any Squires at all due to the too-skinny necks (it's the carve removing too much meat not the width and depth dimensions). Many of the competitor brands offer chunky necks, from Epiphone to whatever is filling Walmart these days. Squier needs to market both and identify both. PRS has the Wide-Thin and Wide-Fat and not well defined what those terms actually mean (like measurements) but it's a model to service the market. Some players/buyers have bigger hands than others -- which must be shocker -- even teenagers have larger hands. As for models they should offer loaded pickguards as quick-swap kits to go from SSS to HSS to HH to SS (like Tele) in the Strats, similarly offer swappable loaded pickguards for the Duo-sonic/Mustang/Jazzmaster/Tele/etc/etc models. Make it super easy for an owner of an Affinity to buy an inexpensive loaded pickguard and plug it into the guitar. Offer trem blocks like the Eric Clapton Strat kit so Squier owners can block their trems, for cheap. Create 'fast upgrade harnesses' to change from the 1/2inch pots to full MIA-grade pots/caps/switch/jack. Create packs of 'Alnico' pickups to replace 'Ceramic magnet' stock pickups (which seems to be the first 'upgrade' owners do, rather than just adjust pickup heights...). These are the mods Squier buyers do to the guitars -- part of the learning to play guitar is also learning what makes a difference in the guitar tones -- the goal of which is to move beginners into players who upgrade to MIA Fenders as they get better and know what they want. Also, keep focus on fretwork. That can stop many beginners from ever progressing and never buying MIA profit margin models. With a full-depth body! I’ve already had two of the thin ones, the only thing I’d realistically plunk my $ down for is a 1.75” thick white Strat, with a black guardplate and a ...whatever they’re substituting for rosewood these days, fretboard. Or maybe a Tele/Jazzmaster hybrid. would like to see new 24 series starcaster and X155 But doubt they will because of production cost. Yea fender had a floyd rose squier series.. in the 90s.. made in japan..
That particular facebook squier was a mid 80s and had a different floating bridge on it (schaller)..
that is a replacement i dont recognize.. not stock.. I've been lusting for one of these for far too long now. Wouldn't mind at all if it said Squier on the headstock. SquierTap, rbh32 and Taurus like this. Also, a reissue of the Hello Kitty strat in my profile pic please. I want one for the novelty, but can't justify the price now. It's $210 USD. I've never been a fan of FR or FR style locking trems, so I don't think it's for me, but is it worth that price? Might be interested in fixing it up and perhaps selling it to someone for a higher price if it's a decent guitar. From what I've heard Japan made Fenders and Squiers are really good.